Two decades of experience at Fresh Locations has gone into making our new Melville London location house a surefire success. Owner Julie Thomas is a respected hair and make-up artist. Obviously that requires versatility, but her preferred looks are always simple: think clean, beautiful skin and fresh, natural hair. It’s an approach that translates into her home, where the watchword is simplicity. 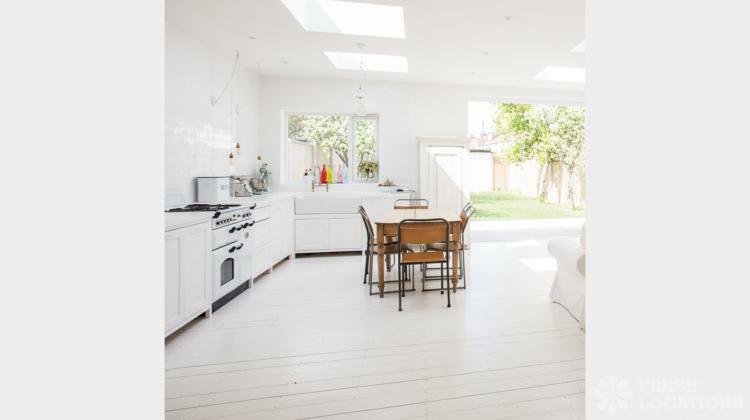 A charming Thirties semi-detached property in North London, it was built at a time when the British were becoming a nation of sun worshippers and started eagerly letting the light into their homes via curved bay windows and stained glass-panelled hallways. Whilst retaining these gorgeous period features, Julie has brought the property up to date with a stunning rear extension. So many British houses, especially in the capital, are quite boxy in their proportions but Julie wanted to give her location clients the luxury of space and the ability to achieve true depth, even on TV location and film location shoots. Effectively her house boasts three good-sized reception rooms opened up into one extremely generous space. ‘It’s a great lifestyle location because there are still plenty of interesting corners for models to lean against but you’re not all huddled up as with many photo shoot locations in London,’ smiles Julie. Light pours through windows and roof lights to the rear of the house while the windows at the front, on the street side, are frosted to create a completely different kind of lighting mood. Almost everything in the house is white, with a simple white-painted wood kitchen complete with white Fifties-style cooker, fridge and butlers sink. The look here is low-key vintage, but it’s a take on vintage that whispers rather than shouts. ‘It’s very much a blank canvas, anything that you photograph – from fashion to still life – becomes the star of the shot. The house simply provides atmosphere in the background’. Her husband Jim, a roadie in his youth, has his impressive collection of vintage music posters by the likes of The Clash and The Ramones confined to the hall. ‘We do have some leaning against the walls in the living room – but nothing that isn’t easily moveable’ laughs Julie. New floor-to-ceiling, fold-back windows open onto the garden which is almost graphic in its simplicity. High quality astroturf ensures that the lawn is green and pleasant year round, while fruit trees growing at intervals down each side are perfect for stringing up charming fairy lights or bunting as required – delightful for kids’ and lifestyle location shoots. The whole house is painted in Farrow & Ball’s ‘All White’ (although decorating is permitted), ‘I’ve long been on the lookout for the perfect white for a location house – something that is not too stark, not too grey – just a lovely soft white shade,’ she explains. Julie has also included different backdrop textures including tongue and groove and panelled cupboards in the bedroom and bathroom. Having experienced many an uncomfortably cramped bathroom while filming in London over the years, Julie made sure that this bathroom – inspired by classic New York hotel chic - is a great size location for photo shoots and film location shoots.